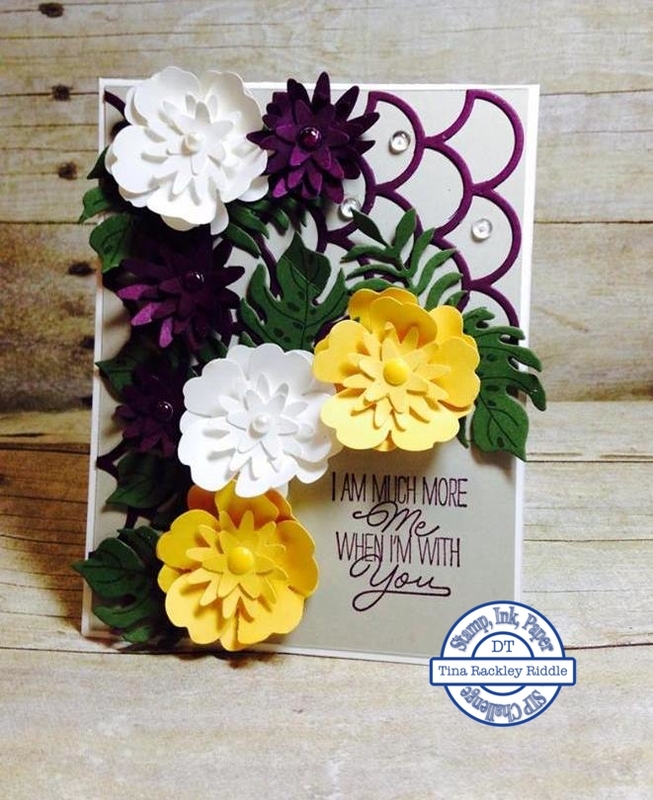 Tina's Crop Shop: SIP #49 Challenge - Flowers! 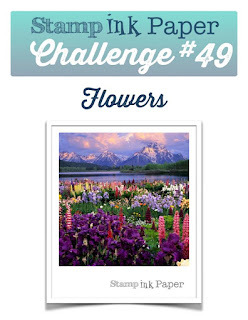 Hello and welcome to Stamp, Ink, Paper's 49th Challenge! Wow! It is so hard to believe we've already had that many challenges! This week's challenge should be super easy and super fun... Flowers! How cool is that?? I think 90% of my cards have flowers on them! I decided I really wanted to use two of the 2014-2016 In colors that are going to be retiring in less than a week.. Blackberry Bliss and Mossy Meadow. I started off with a Thick Whisper White card base 11" x 4 1/4" that was scored at 5 1/2". For some reason I seem to be loving the top fold cards lately! My next layer was Sahara Sand. I stamped my sentiment from the Layering Love stamp set in the lower left in Blackberry Bliss (my absolutely favorite of the 2014-2016 In colors!). I can tell you that I believe Layering Love will be one of my new favorite stamp sets. I absolutely loved the retiring Feel Goods stamp set but I am thinking that this awesome set with fulfill my large sentiment need! The reason I picked this particular sentiment is that I am planning on giving this card to my hubby on Father's Day. He and I have been doing a lot of landscaping lately. Almost every time we have a little time to kill, we end up at one of the local nurseries looking at flowers! I really think even though it's not your traditional masculine card.. he will love it! I used a partial Blackberry Bliss Striped Scallop Die Cut for the backdrop for my flowers. It was one I had cut a while back and just ran into today.. lol For the flowers I used a combination of Blackberry Bliss, Daffodil Delight, and Whisper White. For the larger flowers I layered the Pansy Punch with the Blossom Bunch Punch. For the smaller flowers I used the Blossom Bunch Punch only. I used my bone folder to curve all of the blossoms. The leaves were stamped tone on tone with the Botanical Blooms Stamp Set using Mossy Meadow Ink onto the same color card stock. I used the Botanical Builder Framelits Dies to cut out the leaves as well as a few fern branches. I also added three Pretty Pink Posh Droplets. Hope you liked it as much as I do!